Luxurious comfort for all four seasons. The Royal Comfort 1200 Thread Count Damask Stripe Cotton Blend Quilt Cover Set + Goose Pillow Twin Pack provides 5-star indulgence in the bedroom, whether in an ultra-modern interior or a classical antique room. Comprising of 60% Cotton and 40% Polyester, the Royal Comfort 1200 Thread Count Damask Stripe Cotton Blend Quilt Cover Set + Goose Pillow Twin Pack is carefully woven so the cotton is on the face of the sheet set and the polyester is underneath to ensure easy care and a wrinkle resistant finish. The epitome of luxury with their beautifully silky feel, superior quality cotton blend and a 1200 thread count producing a finer weave for a finer fabric. 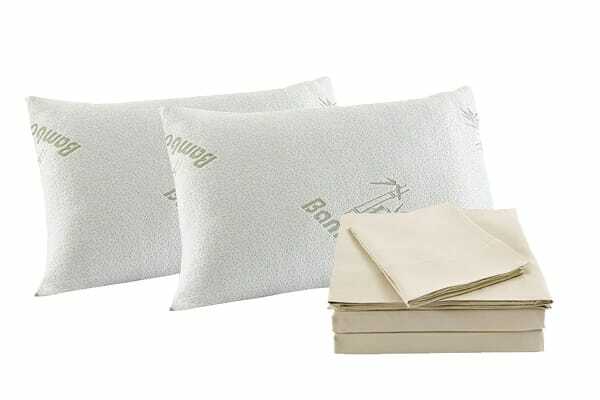 Double up on a good night’s sleep with Royal Comfort’s twin pack of goose down pillows. Enjoy the deliciously soft feeling of falling asleep atop the superior loft and comfort of the finest feathers. The breathable, all natural materials help to you to enjoy a deep sleep and leave you feeling refreshed and energetic come the morning.